As East Mosul Comes Back To Life, West Mosul Remains In Ruins : Parallels Three months after ISIS was pushed out of Mosul, the eastern half of the Iraqi city is bustling and growing. But the badly damaged western half is in ruins, and its residents are angry and resentful. A few families are returning to heavily damaged neighborhoods on the outskirts of Mosul's old city. The residents must be cleared by a committee that certifies they are not ISIS members before they start to move back to repair their homes. Those were all banned by ISIS during its three-year hold on the city, which the group considered its capital. In its final weeks, even food was unavailable. ISIS put up much less of a fight here than it did across the Tigris River in west Mosul and damage in the east was relatively quickly repaired. Liberated just three months ago from ISIS, the devastated west side of the city is a much different story. When Ahmed Jawdat's clothing shop on the west side was destroyed in the fighting, he opened a new one on the east side. "Most of the things I sell were forbidden by ISIS — pants for women, party dresses — anything beautiful like that was banned," he says. Sparkly sleeveless evening dresses, colorful tops and skinny jeans imported from Turkey hang from the racks. Jawdat says business is good and says east Mosul now is safer than Baghdad. ISIS put a foothold in Mosul months before it took over Iraq's third largest city three years ago. Before that al-Qaida terrorized residents through killings and kidnappings. With ISIS driven out, the city seems more relaxed than it has in years. Jawdat says if the west side starts to recover, he will take a look at reopening there, too. "All they have to do is reopen the roads," he says. "If the government can't help the people of Mosul, the people will start rebuilding themselves." Ahmed Jawdat at his shop in east Mosul. Most of the things Jawdat sells were banned under ISIS. When his shop in west Mosul was destroyed he re-opened on the east side. But for now, the difference between east and west Mosul is like day and night. More than 2 miles from a newly opened temporary bridge across the river, traffic slows to a halt. U.S. airstrikes bombed Mosul's five bridges to prevent ISIS from escaping. They haven't been repaired and only two floating bridges connect the two sides, each with a single lane. Taxis, cars and trucks wait for hours. Many are families from west Mosul going back to assess whether anything is left of their homes. A bend in the road before the new bridge offers a dramatic view of the destruction on the west side of the city. That's where Sadiq Ramadan and a friend are standing against the stone balustrades and snapping selfies. Before the fighting, Mosul had a postcard pretty skyline — minarets of old mosques juxtaposed with church spires and centuries-old stone buildings. All that is gone — the view now is shattered rooftops and the monochrome of grey concrete rubble and black scorched buildings. Ramadan, 28, has come back to the city he was born in to visit friends. He's spent the last three days walking around the city. "It was so hard for me to see this — it makes my heart hurt," he says. Ramadan's family left six years ago when it started getting dangerous. His brother later disappeared and is believed to have been killed. He says he doesn't think he'll ever move back, but it's not because of the danger of the physical destruction. "No one is left of our neighbors," he says. "They're all strangers. If I came back I would feel like a stranger among them." 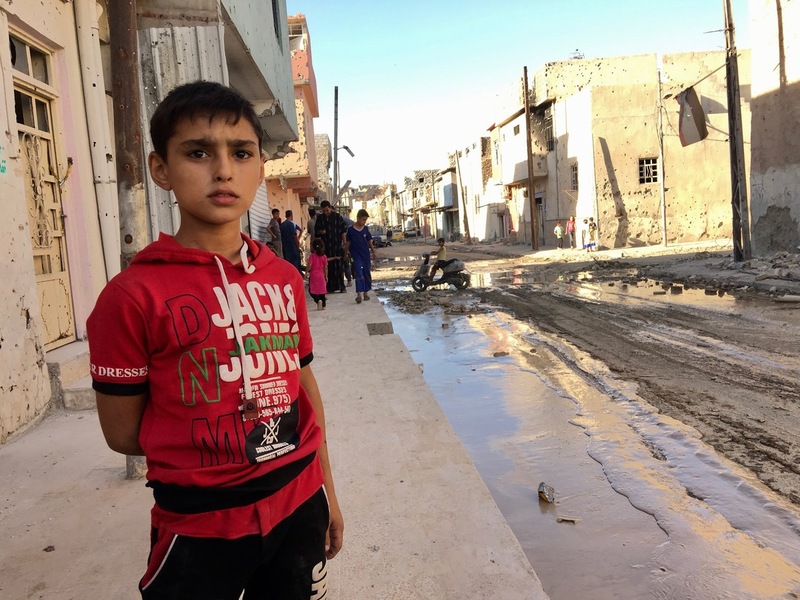 Children cool off on a destroyed street in the old city in west Mosul. There's no electricity or water but residents are starting to dig wells and trying to repair their damaged homes. Residents say when families who had lived in the cosmopolitan city for generations started leaving as ISIS moved in, people from rural villages and conservative city of Tel Afar bought up their houses. While the east side had a large population of Kurds, Christians and other religious minorities, the west side was almost exclusively Arab. ISIS found fertile ground at first in some of the poor neighborhoods in west Mosul. When the battle against ISIS began, U.S.-backed Iraqi security forces moved in from the east, eventually cornering isolating the group on the west side. ISIS gunmen dug into the narrow streets and crowded alleys, laying explosives and using civilians as human shields. When west Mosul was declared liberated three months later in July, U.S. and Iraqi air strikes and mortars had leveled entire neighborhoods, killing several thousand civilians along with the ISIS fighters. A lot of Iraqis believe that people in west Mosul particularly invited ISIS in. "On the west side they are simple people and close-minded — most of them are from the villages around Mosul or from Tel Afar," says Federal Police General Hafedh al-Ta'ie, responsible for security in west Mosul. "The ISIS mentality was more prevalent on the west side than the east." Al-Ta'ie's police are the holding force meant to secure west Mosul. But he doesn't know how long they will stay. For now the police respond to calls about unexploded bombs and check to see whether the residents who are trying to come back have permission to return. 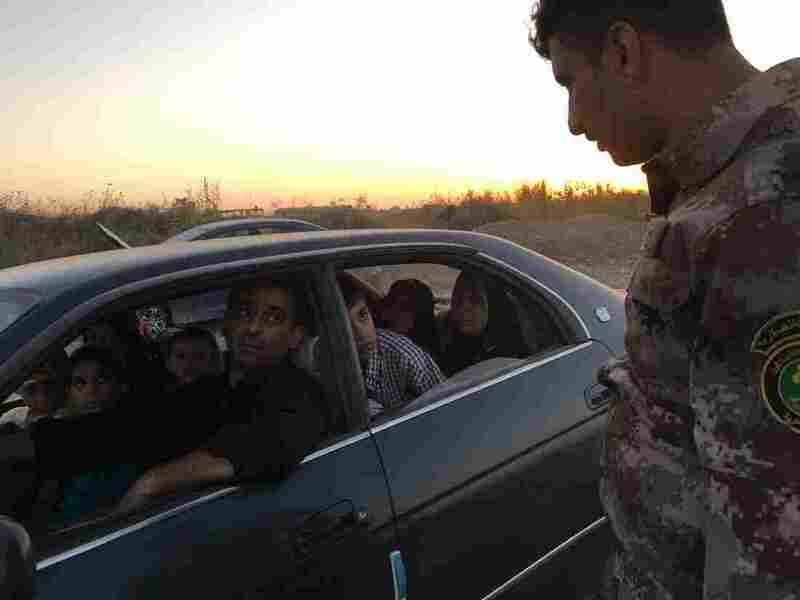 An Iraqi army soldier asks for driver registration at a checkpoint between east and west Mosul. The city's bridges were damaged in U.S. airstrikes aimed at preventing ISIS from escaping. The only links between the two sides are two temporary floating bridges. To prevent ISIS from returning to the city and to minimize looting, a local security committee has to approve any one moving back to west Mosul. In the old section of town where civil defense workers are still digging bodies out of the rubble, most of the neighborhoods are still off limits. Unlike the east side, there is still no electricity in west Mosul and no running water. Hundreds of alleys are still blocked with chunks of concrete from collapsed houses. On one street corner though on the edge of the old city recently, Basman al Rashadi and his neighbors were hanging out on the sidewalk. The buildings are pockmarked with bullet holes and just down the alley there's an unexploded bomb in a damaged house. Most of the dozen or so families who have moved back here have repaired a single room of their homes. Although it's too saline to drink, they've dug wells for water. But they say it's still better than being displaced in east Mosul. "Here we are all from different tribes but we live like one family," Rashadi says. That wasn't the case on the east side. "They treated us like we came from the Caucasus," he says, citing the most foreign place people can think of here. "If rent was $100 a month they would charge us $300," says his neighbor, Nazhan al-Jabouri. "They wouldn't even give us a bottle of water — they wouldn't give us water from their wells." "With all due respect to the good people of east Mosul we suffered a lot from them there," Rashadi says. The men hanging out on the street corner are former policeman — now unemployed. They say they had no choice but to pledge allegiance to ISIS when the group was in control of the city. "They took two of my brothers," al-Jabouri says. His brothers were also policemen and are believed to have been killed. 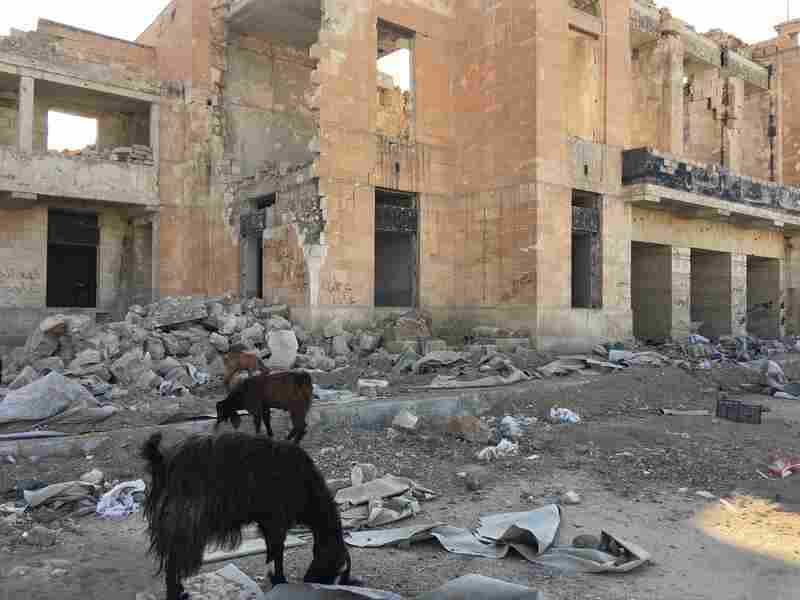 Goats forage in front of the ruins of the Mosul's historic train station –- destroyed in the fighting against ISIS. "We are the allegiance group," says another ex-policeman wryly. They weren't arrested by Iraqi authorities because they weren't ISIS members. But as police who pledged to obey ISIS, they are now barred from re-joining Iraqi security forces. Many Iraqis hold a lingering resentment against the people of Mosul, not just those who pledged allegiance to ISIS. At his base in west Mosul, al-Ta'ie, the federal police commander says he believes ISIS has been so weakened it won't be able to come back again. "But people in Mosul side with those who have strength," he says. "If ISIS became strong again they would side with them. If the devil were strong, they would side with the devil."